Vicegerent of the Holy Dormition Kiev-Caves Lavra metropolitan Pavel of Vyshgorod and Chornobyl, Vicar of Kiev Metropolitan and All Ukraine, the Head of the Commission on Monasteries of Ukrainian Orthodox Church (Lebed Petr Dmitrievich) was born on the 19th of April, 1961 in the village of Borbin, Malynovsky district, Rovno region. After finishing school he studied at Lutsk Trade College in 1978-1980. He studied at the Moscow Theological Seminary in 1984-1988. On the 24th of May, 1987 he was ordained him to the office of a deacon. On the 7th of January, 1988 he was ordained him to the office of a priest. In 1988 he became a prior of the Holy Dormition Church in the village of Nizkinichi, Ivanychy district, Volyn region, nowadays the Holy Dormition Monastery. In 1989 he was tonsured to monastic rank and was given the name Pavel (in honour of Supreme St. Apostle Pavel). In 1922 he was consecrated to the office of an archimandrite. On the 30th of March, 1994 he was appointed the Father Superior of the Holy Dormition Kiev-Pechersk Lavra. In 1996 he graduated from the Kiev Theological Academy. On the 15th of April, 1997 he was defined to be the Bishop of Vyshgorod, Vicar of Kiev Metropolitan and All Ukraine. On the 19th of April, 1997 consecration took place. In 1997 chaired the Commission of Holy Synod on Monasteries of Ukrainian Orthodox Church. In 2003 he was consecrated to the rank of Archbishop and in 2011 – metropolitan. On the 29th of January, 2010 he was included to the Commission on Interconciliar Presence of Russian Orthodox Church on organization the lifestyle of the monasteries and monkhood. Order ‘For Church Merits’ II Degree – 21.08.1999. Order of Prince St. Vladimir, Equal to the Apostles, I, II, III Degree. Order of Venerable Anthony and Theodosius Pechersky, II Degree. Anniversary Order of the Nativity of Christ, II Degree. 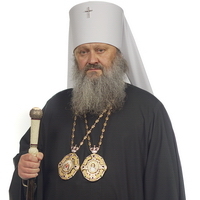 Order of Venerable Sergey Radonezhsky, II Degree. Order of Dmitry Donskoy, I Degree – 02.10.2007. Serbian Orthodox Church – Order of St. Savva, II Degree – 08.10.1997. Polish Orthodox Church – Order of St. Mary Magdalene. Orthodox Church of Sinai – Order of Great Martyr Kathrine. Order of Metropolitan Tihon (Fund of Prelate Tihon). ‘Order of Merit’ of the President of Ukraine, II Degree. ‘Order of Patriotism’, II Degree, – 30.04.2000. Medal ’10 Years of the Independence of Ukraine’, II Degree – 30.07.2001. Badge ‘Sign of Respect’ – 19.03.2001. Order ‘Cossack Glory’, II Degree – 28.03.2001. Medal ‘Honourable Sigh of the Ministry of the Interior of Ukraine’ – 04.01.2000. Cross of Respect ‘For Redevelopment and Formation of Interior Troops of the Ministry of Internal Affairs of Ukraine’ – 19.04.2001. Medal of the Ministry of Defense of Ukraine ‘Valour and Honor’ – 17.04.2001.